For more than a quarter of a century, the band cave-stomped their signature brand of rockabilly and blues with a blend so stripped down that for years, they used no bass. Relying on sinuous guitars and drums to stake their rhythms, they created a sound that invoked surf rock, grade-B horror films and a whiff of medicine show. Lead singer Lux Interior hated the use of the term psychobilly to describe their sound but the fans embraced it. The Cramps obliged those delighted to follow music down any dark and twisting corridor: their live shows were sweaty, primal and wild. They sounded like they crawled from an oozing swamp, or the back of some toxic ’50s auto graveyard. And the fans wanted to dive right in. 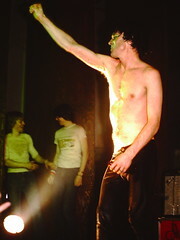 The band’s genesis is described on the liner notes of their EP, “Gravest Hits”: “In the spring of 1976, The Cramps began to fester in a NYC apartment. Without fresh air or natural light, the group developed its uniquely mutant strain of rock’n’roll aided only by the sickly blue rays of late night TV.” Actually, you have to go back a little earlier, to 1972 in Sacramento when Lux first met Poison Ivy, his future wife and guitarist. Their mutual interest in everything from monster movies to vintage cars brought them together and then led them, first to Akron and then to New York where they got in on the ground floor of punk rock. The duo formed the unchanging core of the band, with additional members like guitarist Bryan Gregory and drummer Nick Knox rounding out the lineup by 1977. In our video clip, recorded in 1979 at Irving Plaza, their electrifying version of “The Way I Walk” captures a band at the height of its power. 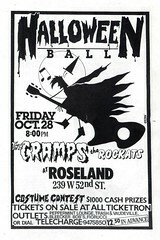 In 1980, The Cramps relocated to Los Angeles. Through management problems and personnel changes, they soldiered on, recording and touring extensively in Europe. They enjoyed wider success in the U.K., even breaking into the top 40 with the single “Bikini Girls with Machine Guns” in 1991. Back in the U.S., they graced the small screen in 1996 with an unlikely guest spot on a Halloween episode of “Beverly Hills 90210,” entitled “Gypsies, Cramps, and Fleas.” Lux also supplied the vocals for a group called the Bird Brains in an episode of “SpongeBob SquarePants.” Now, that’s scary! In 2009, The Cramps officially came to an end when Lux Interior died of a heart attack. He had a pre-existing condition, but as described on the band‘s official website, his passing was “sudden, shocking, unexpected and totally devastating.” There was no way to go on. We end with a suitably spooky story about The Cramps told to us by a roadie friend who swears it is true. In 1978, his band rehearsed in a space on the Bowery. One early morning, as dawn was breaking, they were leaving the building just as a freight elevator emerged from the basement. 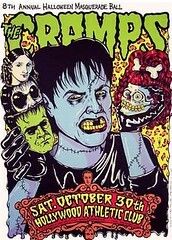 On it were The Cramps looking for all the world like they were rising from a crypt. 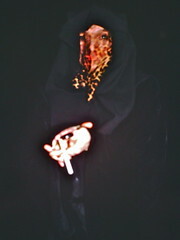 A Bowery derelict awoke from a snooze, saw them and ran screaming. This post originally appeared on The Local East Village.